A future place to shop, live and gather in the heart of Crystal City. Thank you to everyone who has already submitted a letter of support in favor of the proposed performance agreement with Amazon for their new headquarters in Crystal City! If you can make it, please join us this coming Saturday, March 16, at the public hearing. The Arlington County Board will be holding the hearing starting at 8:30am at its Saturday, March 16 Regular Meeting. The Board meets in Room 307 on the 3rd floor at the Ellen M. Bozman Government Center, 2100 Clarendon Blvd. Arlington, Va. 22201. The County Board will consider several other agenda items beginning at 8:30 a.m and the Amazon public hearing is expected to begin at 1 p.m. or as soon thereafter as possible. Your attendance at the meeting will make a big impact on the Board’s decision! If you can't make Saturday's meeting, you can still submit a letter of support to the Board, add your input in the comments section, and share the project with local neighbors. Submit a letter of support to the Arlington County Board! Thank you to everyone who has submitted letters of support for Amazon’s new headquarters in Crystal City! Each letter goes a long way towards making this project a reality. We are excited about the revitalization that Amazon’s presence will bring to the Crystal City community by boosting the local economy and creating a center for innovation within Arlington. If you haven’t already, you can still submit a letter of support to the Arlington County Board. Please also share the project with local friends and neighbors who would like to add their support and submit a letter to the Board. Show your support and join us on March 16th! Thanks for all your participation and input on shaping the plans for Central District Retail and 1770 in Crystal City! We'd like to ask for your support to encourage the Arlington County Board to approve the County's performance agreement with Amazon for their new headquarters. It only takes a few seconds, and it's the most impactful thing you can do to make the new Amazon headquarters in Crystal City a reality! If you're available to attend, the Arlington County Board will be meeting at 8:30AM on Saturday, March 16 at 2100 Clarendon Boulevard to vote on the County's performance agreement with Amazon for their new headquarters. If you can't make it, you can still complete a letter of support. Thanks again for your participation! Thank you to everyone who has commented so far! We’ve appreciated all your feedback and it’s helped us get a better understanding of the community’s interest in the project. To continue the dialogue, we’ve added some new questions about the specifics of the construction process. >> Answer new questions here. Thank you all for the insightful input and ideas you’ve shared with us so far. Thanks to you we have accomplished so much already. We are excited to announce that we will be starting to redevelop 1770 Crystal Drive to make way for an updated office building and will be beginning garage work below the future Central District Retail development. After 12 months of community conversations and 12 public meetings, the Arlington County Board gave unanimous approval of the two-phase plan to redevelop the Crystal Square portion of Crystal City. The new Central District will deliver 130,000 SF of new retail at 1550 Crystal Drive, including the addition of the Alamo Drafthouse Cinema and a grocery store in late 2020. Additionally, a new two-story retail building will stand at Crystal Drive and 18th Street. This project will be built above a new entrance to the Crystal City Metro Station and will be adjacent to a new one-acre public park. We’d like to thank everyone for the time and effort you dedicated to the conversation about this project. We are grateful for your feedback, opinions and suggestions on the project as they have helped shape our plans to your vision and the needs of the community! We’d love to hear from you as the conversation continues. Please continue to leave your questions and suggestions in the Comments section, and stay tuned for more news and milestones posted here. Thanks for all your participation and input on shaping the plans for Central District Retail and 1770 in Crystal City! On Saturday, the JBG Smith team looks forward to presenting plans to the Arlington County Board. We will share a report with comments and letters of support so your feedback can be incorporated into the decision-making process. If you're available to attend, the JBG Smith team will being serving breakfast and coffee starting at 8:30am in the lobby of 2200 Clarendon Boulevard. We anticipate the project review beginning around 10:00am. We hope you can attend and share your voice in person. If you can't make it, you can still complete a letter of support or add comments. Thanks again for your participation! Please join us on Saturday October 20th in the lobby of 2200 Clarendon Blvd for coffee, snacks and refreshments! 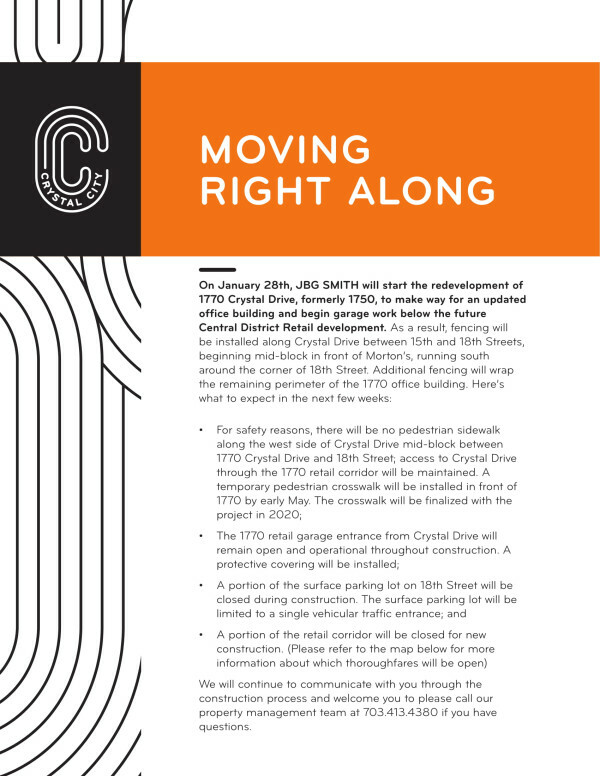 The JBG Smith team looks forward to connecting with the community to discuss their plan for the new Central District Retail project. If you are interested in testifying at the hearing, please let us know. We understand if you cant make it in person, but please take a quick minute to sign this Letter of Support and share your thoughts with the Arlington County Planning Board. Please help us make the new Central District plan a reality! Arlington County Board Hearing on October 20th at 2100 Clarendon Blvd. On October 20th, 8:30 AM at 2100 Clarendon Blvd. 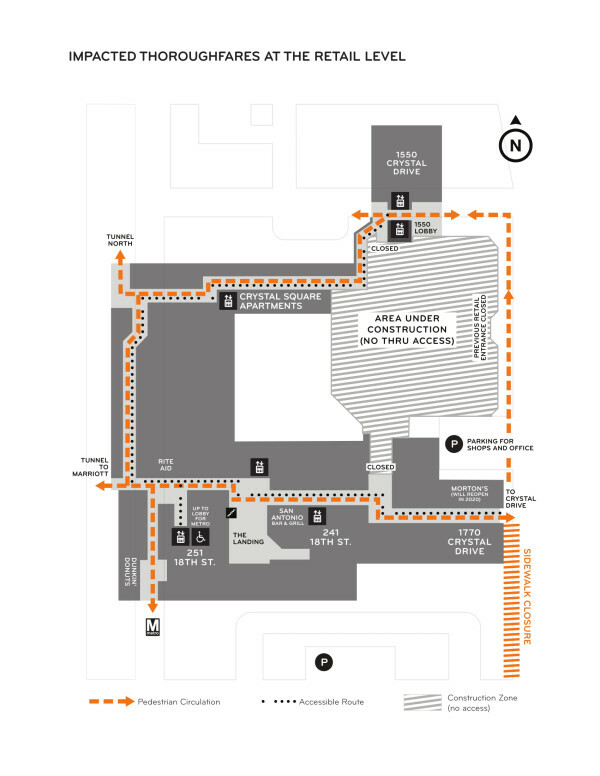 the Arlington County Board will be hosting a hearing for the Central District Retail project. We have been hearing a lot of great comments from the community, and our team is excited to help make a vibrant Crystal City a reality, but we need your help! Please join us on October 20th and voice your support. If you cant make it in person, please take a moment to sign a Letter of Support to the Arlington County Board. It only takes a few seconds, and it's the most impactful thing you can do to make the new Central District plan a reality! Thanks for all your feedback so far on the Central District at Crystal City. Our team is thrilled with all the creative and thoughtful ideas for making this a vibrant gathering spot, but we need your support to make this vision a reality. Pease sign and submit a Letter of Support to the Arlington County Board. It only takes a few seconds, and it's the most impactful thing you can do to make the new Central District plan a reality! A reminder we have a community meeting this Monday, September 17 at 8:30pm! We would love to see you there to share additional information and answer any questions you might have. Join us Monday, September 17 at 8:30pm for a Site Plan Review Committee Meeting. We plan to provide project updates and answer any questions related to the project. We hope to see you there to hear your input and answer any questions you might have. 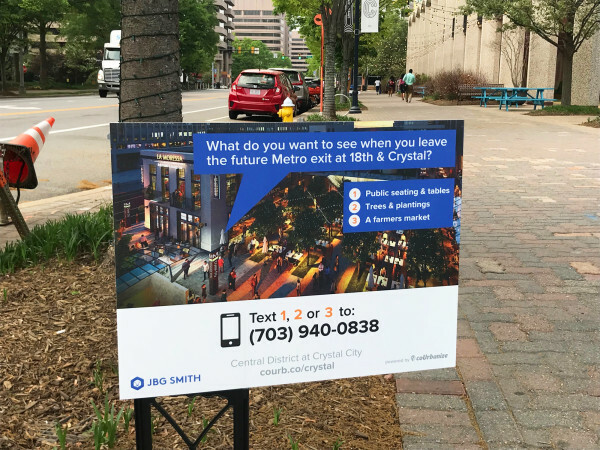 JBG Smith has just launched an exciting new way to get your feedback on Central District at Crystal City! 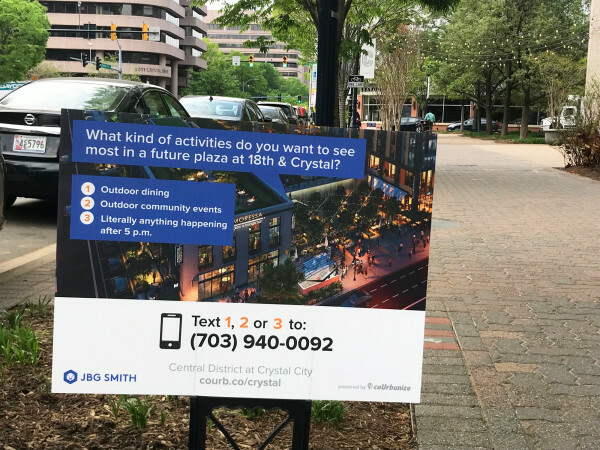 Look for 12 signs like these posted near 18th and Crystal Drive, asking questions about your preferences for the future plaza and corner retail. Text in your answer to post a response. Speaking of the corner building, we'd like to hear your thoughts. If you haven't already, please answer our community questions. What do you want to see at 18th and Crystal Drive? New questions! Thanks for your feedback so far! We're starting a new phase of outreach today. The building above is planned for the corner of 18th Street And Crystal Drive. It's a solution to a number of current challenges: a 17-foot change in elevation, lack of ADA access, and absence of usable space. The building would cover existing vehicle ramps, create two flat park areas, and provide elevator access to them. 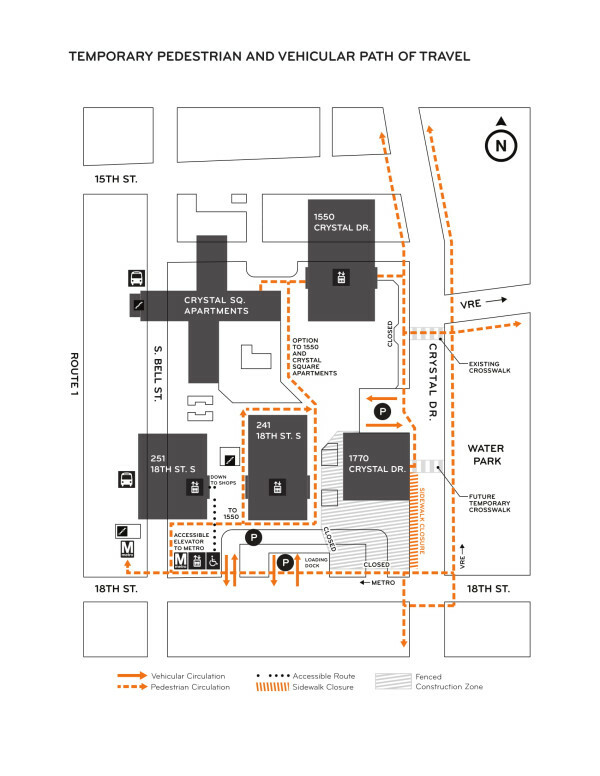 It would also anchor a new Metro entrance, and activate the area with street-level retail and outdoor event space. Finally, the corner building would not reduce the total park area called for the in Sector Plan. What’s most important to make this corner complete — and do you support the corner building plan? Take a moment to answer our new community questions! The Central District open house scheduled for tonight has been canceled due to inclement weather. We will let you know if it is rescheduled. In the meantime, feel free to ask questions in the Comments section. Join us at the Crystal City Metro Market Square open house! Join JBG Smith and Arlington County to discuss the future open space around the Central District on March 21 from 7 to 9 PM. Can't make it? Add your ideas in the Comments section. 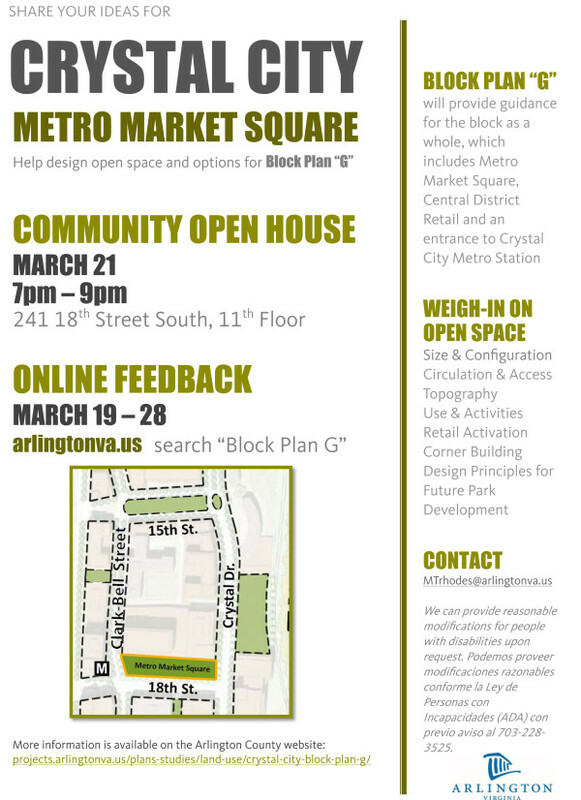 Share your ideas for Crystal City Metro Market Square at a Community Open House! Participants at this Open House will weigh-in on an exciting new design for open space in the heart of Crystal City. Online feedback will also be available March 19-28 via an Arlington County web-based survey. Open house location and survey link will be updated when finalized. Join us Monday, January 29 at our first Long Range Planning Committee and Site Plan Review Committee meetings for Phase II of the Central District. We are excited to introduce plans for a residential development and 18th street public park. Hope to see you there! Join us Thursday, December 14 at our third Site Plan Review Committee Meeting. We are excited to share information and plans on building architecture, transportation, community benefits, construction, and some additional follow-ups from last month’s meeting. We hope to see you there to hear your input and answer any questions you might have. Join us Monday, November 20 at the Site Plan Review Committee Meeting to hear more about our plans for the block! We have exciting information to share on the on the proposed Alamo Drafthouse Cinema, grocer, and retail space. We hope to see you there to hear your input and answer any questions you might have. Welcome to the Central District site! Thanks for visiting our new outreach site. We're using this site to help you participate in the Central District development process and keep you updated the latest plans, studies, and upcoming events. Click the Follow button to receive email updates, and visit the Comments section to share your comments and questions with us.